I don`t know why its taken me so long to get to read this thread, but I have been enthrauled by the reading here and on the previous site and the pictures are amazing. I have fallen in love with this vessel and it`s very important to Norwegian Maritime Heritage that she is saved and brought home to Norway. I have signed the petition and will start on thread on my forum to help spread the word all over the globe. We have similar issues with two vessels here in the U.K., the SS Manxman and the MV Royal Iris, when I get time I will prepare a thread on both these vessels. I don`t know why its taken me so long to get to read this thread, but I have been enthrauled by the reading here and on the previous site and the pictures are amazing. I have fallen in love with this vessel and it`s very important to Norwegian Maritime Heritage that she is saved and brought home to Norway. 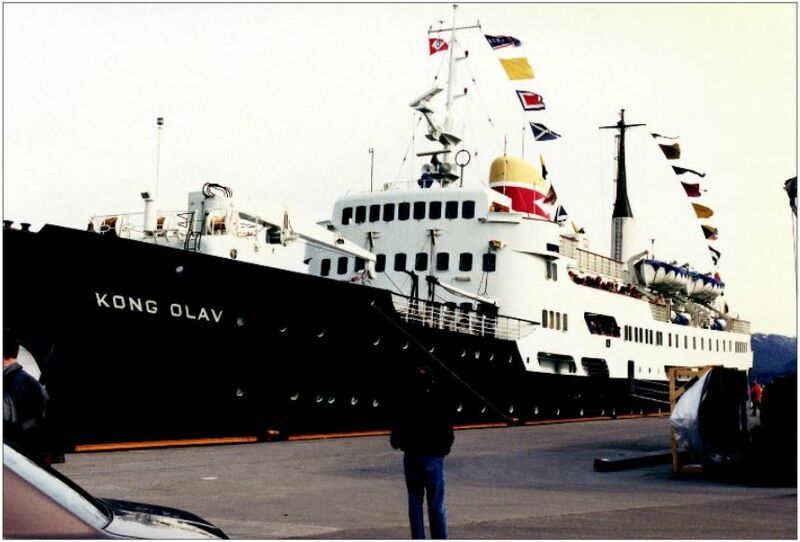 Bill, I don't know whether you have seen my thread "A Salute to the MV Kong Olav"
It may interest you - a journey on the ship which I took in 1990. Thank you so much for posting this, Sigve. I'm very pleased to have seen it. A very rare image indeed... she looks sparkling new! That could be because she is on her maiden voyage. Ships are generally new at that stage. Ahh, you will know in a few days. The image has been taken in VADSØ. A warm thank you is extended to Jan Erik Kristoffersen for being able to identify the place for us. In our local newspaper today was this image from "Kong Olav"s last visit in Kristiansund, 28th April 1997. From the light conditions, it looks like it is the southbound hurtigrute. Oh, thank you, Svein. My goodness, how that brings back memories - I can feel myself standing on that quay about to hurry up the gangway after time ashore. On the return journey southwards we arrived there at 4.30p.m. on Saturday, 19 May, 1990 for just half-an-hour's stop, but I know that I would have dashed off the ship even if only to walk up and down the quayside for a few moments! Unfortunately I have no photo of my own of the Kong Olav at Kristiansund to show on my old Kong Olav thread, which perhaps you have looked at? It is absolutely great to see this picture, you will never know what it means to me. Was there an article about it in the paper? I am wondering what occasioned the publication of the photo. How nice to read your good memories, from the quay in Kristiansund! There was no article in the newspaper, as each day, they print something called "Minnenes Album" (The Album of Memories) and just today there was "Kong Olav". To this album everyone can send old pictures and a few words, and the words under todays picture was only the name of the ship, last date and year in the city and that she was sold to Thailand. In this "Minnenes Album" there are often small 'diamonds' in the case that private people get to publish their own images, and then it comes images never seen by others. In this coastal and maritime city of Kristiansund, it's often pictures and short stories of boats and ships. I'm more interested when there are asked questions to the picture, as I then can start digging into history either by books, old papers or internet. Last edited by Daniel; January 3rd, 2011, 16:21. Picture taken of the Kong Olav on 16 February 2011 in Burma. All lifeboats are now removed. She looks a little scruffy externally, but nothing "fatal". The heavy rust streaks on the front is from the connection between the steel and aluminum superstructure. How she looks internally is more of a question. If no dehumidification or forced air circulation, and in the hot humid climate where she is now, heavy condensation and molding is likely to have taken place, causing damages to the furniture and fittings etc. The Engine Room is also very much a question mark. If machinery and equipment have been idle and not turned over, it is little hope of just starting her up without major and expensive overhaul and replacement. In other words, she will have to be towed from there, regardless of her faith. PS> I notice both anchors are deployed but without any restraining against turning. Those chains are bound to be something seriously twisted and tangled. Hallo, Fosgate 8309, I have just looked at your other post, and now to see the Kong Olav in the photo above is almost unbelievable. I have mixed feelings, part heartache to see her in such condition, especially bearing in mind Ombugge's thoughts, but also joy in seeing her in a photo taken only yesterday. My interest is because of a trip I took right up the Norwegian coast from Bergen to Kirkenes and back in 1990, a trip that I have always remembered. Members here helped me identify some of the locations which I had forgotten, and that helped me to do a thread on the trip. If my memory is correct, my cabin was starboard so one of those portholes was mine! See here, it may be of interest to you.